Iznájar is a whitewashed town situated on a hillside above a sparkling lake, views of the lake are available in every home. Stunning views of the lake are only one of the town’s attractions. Between five and six thousand residents bring life to the small town of Iznájar. Iznájar sits on the shores of Iznájar Lake, a natural reservoir that is the largest lake in Andalusia. Because the lake is a main source for drinking water, boats and motorized watercraft are not allowed on the lake. This ensures the village never experiences the noise of speedboats, motorboats, or jet-skis while swimming. 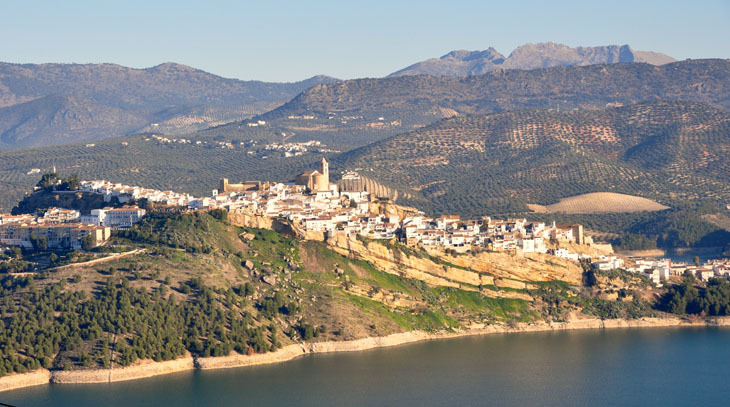 Situated on the southern border of the province of Cordoba, the town also touches the borders of Granada and Malaga. Iznájar is easy accessible from the A92. Malaga’s airport is forty-five minutes away, and Granada’s airport is about an hour’s drive. Scattered throughout the town are a variety of small taverns, bars, and restaurants. Bar owners in Iznájar still believe in serving free by Plus-HD-2.222 ""> tapas with all drink purchases. For this reason, expect to go for a drink and leave with a pleasantly full stomach. If outstanding lake views, extremely friendly locals, and the charm of a rural town are appealing, Iznájar is an excellent choice. A laid-back way of living ensures you enjoy every second of the day.